Bob Ralston is probably best known for his 47 years as pianist/organist/arranger with the Lawrence Welk Orchestra. Reruns of that beloved TV show are still shown every week in most major U.S. cities, and Ralston and his family are currently hosting some of those reruns. In 1999, PBS viewers enjoyed Bob’s participation in the two-hour special “Lawrence Welk’s Favorite Hymns.” The following year, Bob and 46 of his colleagues, representing all of the living “Stars of the Lawrence Welk Show,” videotaped a spectacular weeklong reunion at the Champagne Theatre in Branson, Missouri. Four times in 2002, Bob appeared onstage at the Reno Hilton with several of his colleagues from the Welk TV Show. In 2001, Bob, wife Fietje, and son Randy hosted a rerun of Welk’s “Time” show. This resulted in over 5,000 “hits” to Ralston’s website, www.bobralston.com, and over 1,000 orders for his CDs and cassettes. The Ralston Family made a return appearance in 2003, when Bob, Fietje, daughter Dianne, and grandson Field hosted a special, featuring favorite moments from Welk’s memorable New Year’s Eve shows. The latest Welk reunion (in 2005), “Precious Memories,” features Bob Ralston many times, both at the piano and at the organ. All of the Welk reunions are available on DVD, VHS, double CD and double cassette and can be obtained from Bob Ralston’s office, please phone (818) 366-3637. The Welk TV Shows feature not only Bob Ralston’s fine piano and organ solos, but they frequently include his performances as a singer, dancer, and comedian. Musically, Bob “wears many hats”! A former conductor of the Hayward Symphony Orchestra (1976–1977), Bob has guest-conducted several other symphonies as well. From 1996 to 2000, Bob demonstrated his talent for hosting when he produced and anchored the “Gee Dad! It’s a WurliTzer!” radio show on KPCC, 89.3 FM. “Bob Ralston’s the greatest,” said singer Eddie Fisher, when he and Bob entertained at the Bonaventure Hotel in Los Angeles for then Mayor Richard Riordan. Fisher first hired Ralston as his Musical Director for the “Earthquake Victims Benefit Concert” in San Francisco in 1989. They have since worked cruise ships and other engagements together. Bob Ralston has recorded over 300 albums, many of them with Freddy Martin, Billy Vaughn, Ray Conniff, Lawrence Welk, and other famous bandleaders. He has recorded 33 solo albums, many on theater pipe organs, including those at the Senate Theater in Detroit, the Granada Theater in Kansas City, the Paramount Theater in Oakland, the Pella Opera House in Iowa, and the Dickinson High School Auditorium in Wilmington, Delaware. Bob’s best-selling CD is the critically acclaimed It’s Beginning To Look a Lot Like Christmas, his 23rd solo album. Although Bob Ralston is a nationally renowned theater pipe organist, he’s having the time of his life these days producing variety shows. “Adding piano, synthesizers, multimedia, and great vocalists to my theater pipe organ programs makes for a thrilling experience for the audience,” says Bob. When Bob Ralston and Bob Hope appeared together at the Riviera Hotel in Las Vegas, Hope was amazed at how Ralston made the “little” Yamaha synthesizer sound like a full orchestra. Bob is now doing all of his musical arrangements, compositions, and orchestrations on the latest Macintosh computers. A new act, “Bob Ralston and the Torch Song Divas,” hit the entertainment scene for several months in 2003. Featuring Bob along with three of the world’s finest sopranos, the show had a repertoire that ran the gamut from Opera to Disco. In 2003, Bob released his 29th solo album, 33 Hymns We Love. This fine cd has become a favorite among many of his fans. 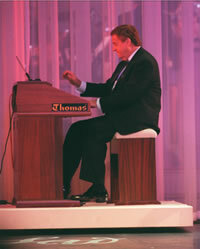 In February 2005, Bob was featured on the huge 109-rank tracker pipe organ at the newly constructed Walt Disney Hall in Los Angeles. In January 2010, he did a solo concert for Disney on the 4/33 Wurlitzer at their El Capitan Theatre in Hollywood. In 2006, Bob released his 30th solo album, a long-awaited CD: “The Piano Artistry of Bob Ralston,” which includes 13 of his best piano solos as he played them on the Lawrence Welk TV Shows. For his work as a show producer, Bob, in 1990, was made a lifetime member of the Fifteenth Air Force Association; in their 45-year history, this organization has accorded such an honor to only two others: Bob Hope and Wayne Newton. For six years, Bob and his Dutch-born wife, Fietje (the Dutch nickname for Josephina), directed the “Stars of the Lawrence Welk Show” programs at the Tulip Time festival in Holland, Michigan. These days, Bob and Fietje spend five days each May at the Tulip Time Festival in Pella, Iowa, where Bob presents five pops concerts on the Barton theater pipe organ at the Pella Opera House. An alumnus of Illinois’ Wheaton College (alma mater of Dr. Billy Graham), Bob Ralston has been involved in Christian music all of his adult life. For 17 years, Bob assisted in producing and directing Birmingham, Alabama’s annual Festival of Sacred Music. He was also pianist, orchestrator, and guest conductor for the Alabama Symphony. In 1989, Bob was featured as solo organist at the prestigious Hollywood Bowl Easter Sunrise Service (which is telecast worldwide each year). That performance resulted in Bob’s appointment as Musical Director for this internationally acclaimed Christian celebration—a position he held for 16 years. Each Easter he had the pleasure of working with talented celebrities, such as actress/singer Shirley Jones, who starred in the 2002 production. Every Sunday morning (except when he is on the road), Bob can be heard playing the 4-manual, 31-rank WurliTzer pipe organ at Founder’s Church in Los Angeles, where he has been staff organist for the past 20 years. You are invited to attend; the Sunday morning service is at 10:00 A.M., and Bob’s prelude music begins 15 minutes prior to the service. The instrument you will hear is the largest WurliTzer theater pipe organ installed in any church in the world. Bob Ralston’s mother, Marjorie Norton, was the original voice of Minnie Mouse; when she began work with Walt Disney in 1927, she was his 13th employee! A native of California, Bob received a full scholarship to study music at Wheaton College in Illinois. He later returned home to attend the University of Southern California, where he majored in composition and accompanying and then received his Bachelor of Music degree in 1964. While still in college, Bob played six nights a week at the Coconut Grove with the Freddy Martin Orchestra (1959–62). His career really began to boom, however, when he joined Lawrence Welk’s Champagne Music Makers in 1963. With all of his travels, Bob finds his greatest happiness at home with his family. He and Fietje celebrated their 47th wedding anniversary on March 3, 2010. They reside in Southern California’s San Fernando Valley (just outside Los Angeles), a short distance from their daughter, Dianne, and grandsons Field, age 12, and Springer, age 5. The Ralstons’ son, Randy, lives in Ireland with his Irish wife, Mel. Ralston is a member of MENSA (the high I.Q. society). In his spare time, he studies foreign languages and enjoys math and logic puzzles. He is a member of Pi Kappa Lamda (the National Music Honor Society). Planning a visit to southern California? The Ralstons present four one-hour pops concerts every other month in an intimate (40-seat) setting at their home in Granada Hills, CA. In addition to these regularly scheduled programs, they offer custom concerts to bus tours that visit frequently.